Have a look at iTunes and download a free sample of the Mission Dream eBook. Follow Iren Dornier, grandson of the legendary aircraft engineer Claude Dornier, on his journey around the world in the Do-24 flying boat. Read how the adventure comes together in this spectacular picture book, containing more than 250 photographs in colour and duotone on over 470 pages. You can purchase the eBook now via the Apple iBook store. It's best viewed on Apple iPad, iPhone and iPod Touch. Iren Dornier, grandson of the legendary aircraft engineer Claude Dornier, first sits in the cockpit of the Do-24 at the age of just 12 years. He decides then, that he will pilot this flying boat himself one day. A great dream, especially since the machine will be taken out of service, ending up an exhibit in a museum. Iren Dornier manages to buy her back and goes on to prove that the virtually impossible really can be achieved if we set our minds to it. In risky conditions he makes this unique example of a type Do-24 flying boat flyable once again and sets off with it around the world. Whether they land on the Hudson River, the Copacabana, Lake Constance or the River Rhine, the silver beauty wins the hearts of everyone who sees her. 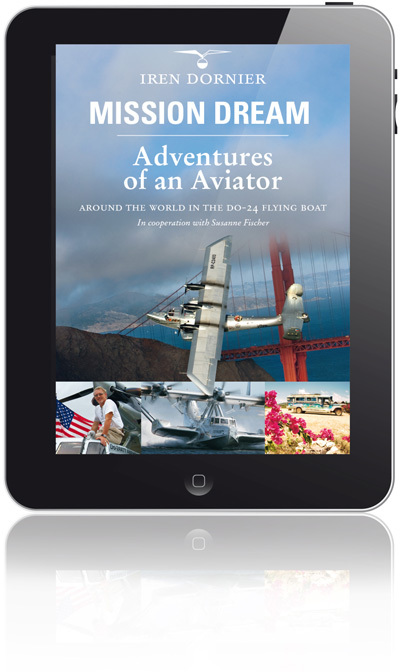 The photographs of their journey come together in a spectacular picture book, an ode to aluminium and to the courage of a modern flying pioneer, who is constantly driven by the most important lesson taught him by his grandfather: never to give up if he wants to fulfil his own dreams. You can easily order the "Diary of a Dream" via following link and let it deliver to your private adress.